The Vrata is observed on the Friday immediately preceding the full moon day of the month of Sravan (August-September). On the day of Varalakshmi vratam, women clean their homes and decorate their front yards with rangolis (colorful designs traced on the floor). Later, they take a bath and deck themselves with beautiful clothes and jewellery. They then begin the process of performing the vrata by first arranging the kalasha or sacred pot. They fill the pot with rice and water which symbolize prosperity and cover it with mango and betel leaves. They then place a coconut smeared with turmeric and vermilion on the kalasha and also decorate the coconut with a new cloth. Some people decorate the kalasha with many kinds of jewels to make it look more beautiful. They place this kalasha on a plate filled with rice. The main puja begins by worshiping Lord Ganesha, who is believed to drive away all obstacles and evil forces. Later, goddess Mahalakshmi is invoked into the kalasha. They then worship a couple of torams (a bunch of nine threads with nine knots) and tie one to the kalasha while the other one is tied around the right hand wrist of the lady performing the pooja. Later, they chant the Lakshmi Ashtottara Shatanamam (a list of hundred names in praise of the deity). They then offer the goddess nine varieties of delicacies including both sweets and savories. In conclusion of the vratam, they sing hymns in praise of goddess Varalakshmi and also invite another married woman assuming her to be goddess Varalakshmi and offer her sweets. That evening, they invite all the neighboring laides to their homes and offer them tamboolam, an offering consisting of betel leaves, fruits, betel nuts, vermilion, turmeric and dakshina (money). They also collectively sing songs in praise of goddess Varalakshmi. Eight forces or energies are recognised and they are known as Sri (Wealth), Bhu (Earth), Sarasvati (learning), Priti (love), Kirti (Fame), Santi (Peace), Tushti(Pleasure) and Pushti(Strength). Each one of these forces is called a Lakshmi and all the eight forces are called the Ashta Lakshmis or the eight Lakshmis of the Hindus. Vishnu is also called Ashta Lakshmi Padhi which is equivalent to saying that he is the asylum for the eight-Lakshmis or forces. In fact, Vishnu representing the preservative aspect of the universe, radiates these forces from him. These forces are personified and worshipped as Lakshmis, since abstract force is beyond the comprehension of the ordinary people. As health, wealth and prosperity depend upon the rythmic play of these forces, the worship of Lakshmi is said to be to obtain these three. Only a woman can sympathise with women. Lakshmi is a woman. So she will more readily sympathise with women. Hence this festival is observed largely by women, invoking the blessings of Lakshmi on them, their husbands and their children. As the legend goes, this is a pooja that was pronounced by no other than Lord Parameswara to be performed by his consort Parvathi to seek prosperity and happiness for the family. Thus it came to be emulated by married women who sought boons (varam) for the health, wealth and knowledge for the entire family. In some cases, women prayed for being blessed with children. The prescribed day for the pooja is the Friday of the month of Sravan in the fortnight known as Sukla paksha, preceding the full moon day. 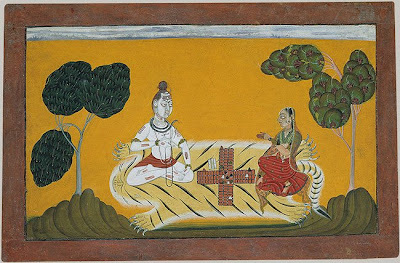 On one occasion, Parvati and Parameswara were engaged in a game of chess. Parvati was winning game after game, but Parameswara is said to have claimed the victory at each games, wantonly, to her intense chagrin. So Parvati wanted to have an umpire and one Chitranemi, a creation of Parameswara, was chosen. As an underling of Parameswara, he sided with him most unjustly. This provoked Parvati's anger and she cursed Chitranemi that he should become a leper for discharging his duty in most unfair manner. When Chitranemi begged Parvati's forgiveness and Parameswara added his entreaties to it, she is said to have relented and modified the curse by adding that he would be cured of his leprosy by observing the Vara Lakshmi Vrata. By doing this Chitranemi was, it is said, rid of the loathsome disease. The history of the origin Of the Vara Lakshmi Vrata is rather interesting. Lakshmi is said to have visited a pious woman by name Sarmadi, living in the city of Kuntinapura in Magadha ( Bihar ), in in one of her dreams and expressed her satisfaction at her devotion to her children. When she woke UP from her sleep, she took a bath and worshipped Lakshmi to ensure her blessings. When the other ladies heard of her dream and her worship of Lakshmi, they too began to worship her, and the custom is then said to have spread everywhere throughout the land in course of time. In the kingdom of Magadha of yore, there lived a brahmin woman called Charumathi in a town named Kundina. The prosperous town was the home of Charumathi and her husband. She devotedly served her husband and her parents-in-law. Impressed by her piety, Goddess Mahalakshmi appeared in her dream and asked her to worship Vara-Lakshmi (literally, boon granting - goddess of wealth) and seek to fulfill her wishes. Varalakshmi is yet another form of Lord Vishnu's consort, Lakshmi, the goddess of wealth. Thus was prescribed the Friday of Sravana month preceding the full moon day for the worship. Narayana priyadevi supreethaa bhava sarvada"
The well dressed women made offerings of delicious feast with utmost devotion. As they went round the deity in prayer, dazzling jewelry is said to have appeared as ornaments on the bodies of these worshippers and their houses filled with riches. They rewarded the priest who assisted them in performing the pooja and they all partook in the feast. The women expressed their gratitude to Charumathi who shared her dream and helped them become prosperous. 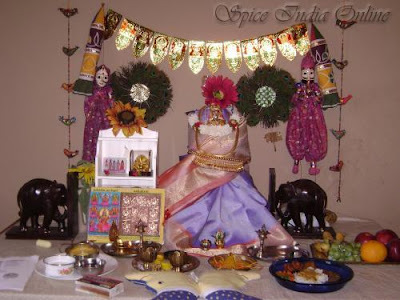 This pooja came to be practiced year after year by women. Done with devotion, it is said that boons would be granted and thus many wishes would be realized.